Remotr - Are MMORPGs dead? World of Warcraft – a massively multiplayer online role-playing game – got its sixth expansion - it was released last week. That’s right - one of the hottest releases of the September is an expansion to a 12 years old game. And here comes the question that rises like a phoenix (or undead, or demon - following the general rule in WoW that to make something insanely strong, you either make it drink demon blood, or kill it and raise it as undead.) every time Bilzzard feeds its hungry fans with new region, dungeon or panda bears. You can also call MMOs a victims of its own success - after the release and huge success there were tons of companies trying to ride on WoW wave. That leaded to market over-saturation. Too many games, too low quality. But was it really that bad for MMOs? Right now there are 3 big players on MMORPG field - World of Warcraft, Final Fantasy XIV and Guild Wars 2 - these are the most popular MMOs in the world. And then there are those Korean MMOs - the glorious grind-fests of farming, crafting, fishing, gardening - oh, and killing tons of monsters in the most over-the-top way possible. One of Korean games that was released quite recently to the West is called Black Desert Online - it is gorgeous. BDO was praised for it’s character creator - using it you can recreate pretty much any face you can think of. 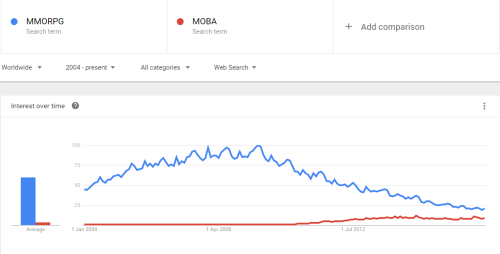 And now back to the initial question - is MMORPG a dead genre? I don’t think so. Not yet. As far as there’s money to be made, as far as there are players willing to play we’ll keep getting new games and expansions. These are online games we are speaking of - and anything that is online can not be killed off that easily. And what it’s like to visit a deserted lands of long forgotten game? I’ll leave you with this - a creepy video of a streamer playing abandoned online game that no one is playing anymore. This may be an elaborated joke, but nevertheless - it makes you think of all that online games you used to play.